Celebrating the Wild West-style films produced in Southern Italy in the '60s and '70s, The Spaghetti Western couldn’t be a more fitting name for a barrel-aged cocktail that marries American rye with Italian digestifs. Casa Luca infuses the rye with blood orange, cranberry, and bay leaves before combining it with orange bitters and Cynar -- an Italian amaro. It ages in a charred American oak barrel and costs $18. Or, try a half portion for $10. The Root Cellar’s Barrel-aged Negroni is proof that barrel-aging should expand beyond brown liquors. 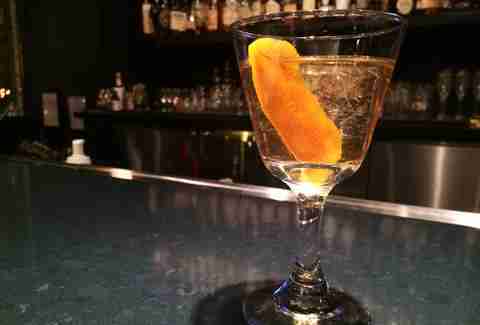 The $15 drink is made with Plymouth gin, Dolin Rouge vermouth, Casoni 1814, and just a twinge of smokiness. (It’s as if someone stirred it with a strip of bacon.) This drink alone is worth a visit to the brand-new whiskey bar tucked inside the W Hotel Washington DC. Pair it with an impressive array of house-made charcuterie from the same culinary team as Pinea, located one floor above. 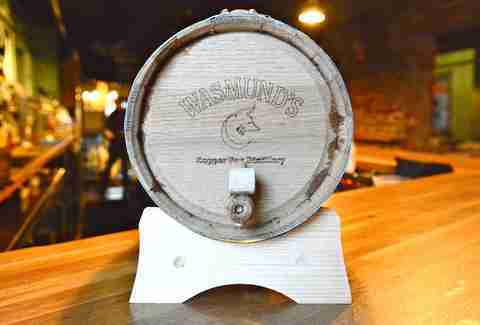 One of DC’s best breweries has been having... a barrel (!) of fun. For starters, a new batch of Desolation just dropped. Instead of adding cold-brewed coffee to their Pandemic Porter to create a coffee stout, they aged coffee beans from Petworth’s Qualia Coffee in a 1776 rye whiskey barrel. Then, they dry-hopped the beer with the barrel-aged beans, creating an assertive coffee flavor worth talking about. Next there’s the Brandy-Lyn -- a barrel-aged collaboration with local cider producer Millstone Cellars. The 3 Stars team barrel-aged saison beer in an apple brandy barrel while Millstone Cellars aged a cider in a bourbon barrel. After six months, they blended the two solutions, creating a super-rare graff (the word for a cider/beer blend). 3 Stars Co-founder Dave Coleman says you’ll likely find the brews at Jack Rose, The Coupe, and Sixth Engine. Named for a county in Southern Ireland, the Tipperary is a classic cocktail starring (you guessed it) Irish whiskey. The Fainting Goat goes with Jameson, Dolin Rouge sweet vermouth, and Green Chartreuse. Once mixed, the cocktail ages in a small barrel from Virginia’s Copper Fox Distillery. Here’s hoping the thirsty masses haven’t drained it by St. Patrick’s Day! This one won’t break the barrel-aged bank at just $10. The mile-long cocktail list at Barmini can be overwhelming, so stick to what’s spent time in a barrel. Rye, lemon juice, maple syrup, Kasteel cherry beer, and barrel-aged bitters make up the Rye Here. Squeamish about combining beer and liquor in a cocktail? Take solace knowing it’s nothing like that beer-vodka-lemonade concoction you played beer pong with when you ran out of good beer in college ("Skip and Go Naked," to some). The maple syrup is definitely what ties everything together. For $22 you could buy two tickets to see Jennifer Lopez murder her career in The Boy Next Door, or you could spend it on one of the most perfect drinks in the whole damn city: The Rye Bar’s barrel-aged Manhattan. The cocktail containing Dad’s Hat Pennsylvania rye, Dolin Sweet vermouth, and Byrrh Quinquina is aged on-property in a giant American Oak barrel. You can’t help but feel like royalty when you sip on it because of the lavish surroundings inside the Capella Hotel. You read that right. 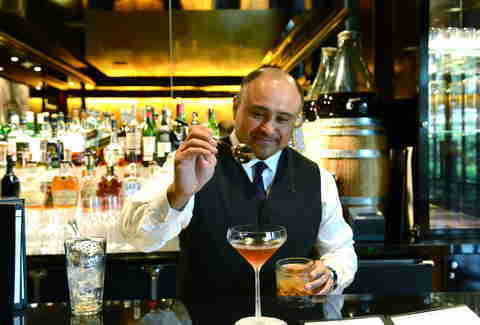 The beverage team at Urbana made an amaro by infusing Everclear with lentil beans. 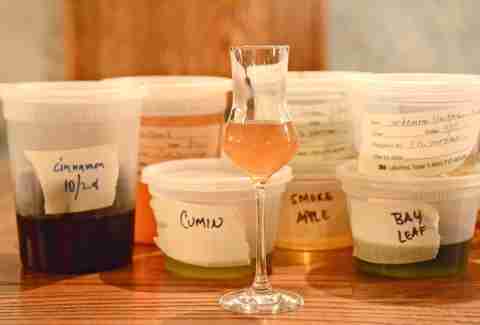 Then, they boosted the complexity of the $10 pour by raiding the pantry and stirring in cardamom, smoked apple, ginger, chamomile, rhubarb, bay leaves, lavender, and more before barrel-aging it. Sure, the first sip tastes a bit like soil, but it’s innovative and worth a try. 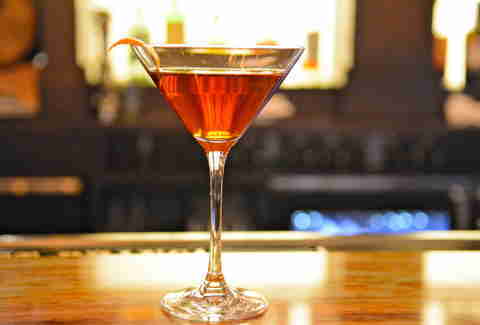 You won’t find it on Urbana’s extensive amaro list though, so be willing to go off-menu (read: impress your friends). Everything at this Georgetown steakhouse is over-the-top when it comes to decadence (looking at you, lobster pot pie!). The barrel-aged Jefferson is no different. Order it, and within minutes a dude will be wheeling a whiskey cart over to your table where he will craft a cocktail out of barrel-aged Bulleit, Carpano Antica, Crème de Mure, and Fee Bros. old-fashioned bitters. Even the ice is carved table-side. The barrel-aged flavor comes the bourbon’s one-month stint in a white oak barrel. When mezcal hits a charred barrel for a few weeks it only gets smokier. 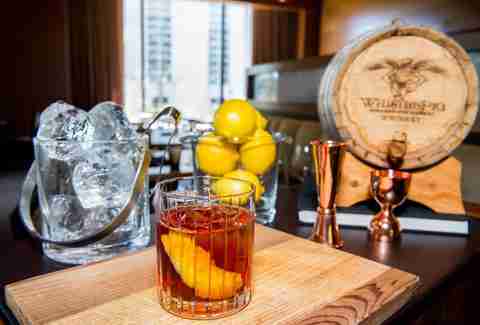 That’s the idea behind Graffiato’s newest barrel-aged cocktail, the Mezcal Old Fashioned. Mezcal is mixed with agave for sweetness, as well as Bittermens Xocolatl Mole bitters, before sitting in a mini-barrel behind the bar. 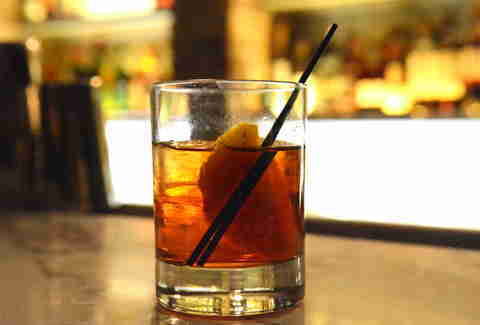 After a few nips, it’s safe to say it would be VERY cool if the Mezcal Old Fashioned caught on throughout the city. 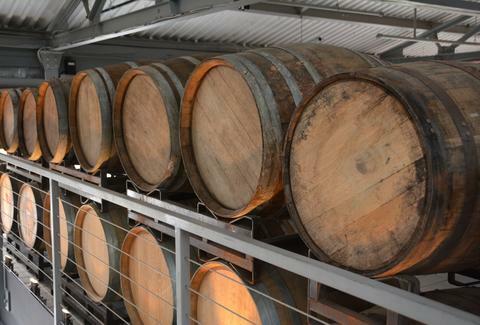 There’s always an impressive barrel-aged beer on draft at Bluejacket -- the Navy Yard brewery that’s full of surprises. 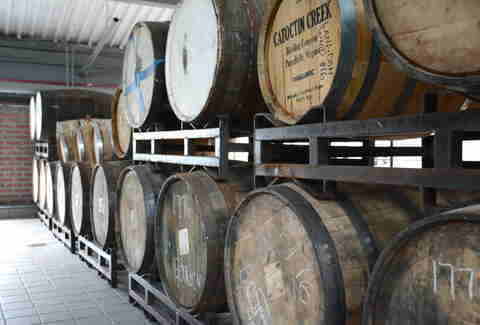 In fact, if you take a tour, you can’t help but trip over barrels tucked into every corner. Recently, they’ve been pouring the Parish Fair, a Belgian-style, strong blond ale aged in Sauternes dessert wine barrels from France. There’s a lot to look forward to in the coming months too, because the team is working on spontaneously fermented coolship beers aged in wine barrels. 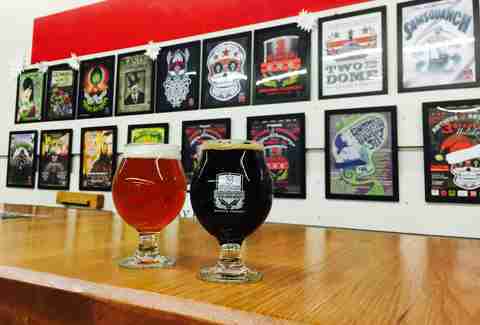 They may not making barrel-aged beer at The Black Squirrel, but they sure are serving it. 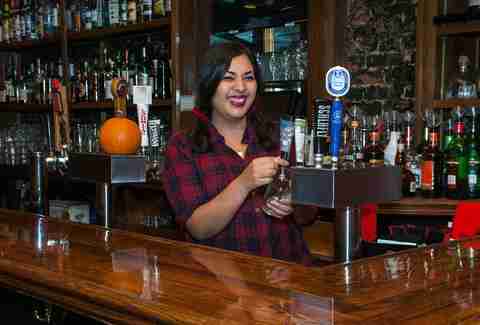 In addition to having a few taps reserved for barrel-aged beers (usually stouts), the bar also has a big crush on sours. Ask about their vintage collection from Goose Island. They’re gearing up for a big barrel-aged beer event in the couple of months, so keep an eye out. 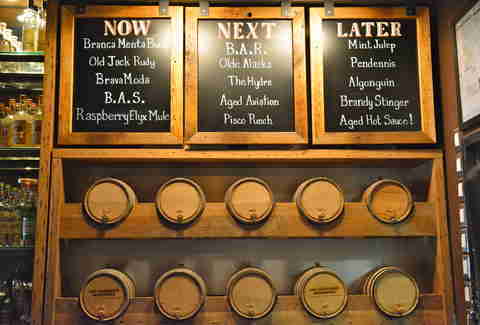 It would be embarrassing if a bar named "Barrel" didn’t have a top-notch barrel-aged cocktail program. Fortunately, they slay at creative cocktails spawned from a cascading barrel program -- meaning drinks gain more complexity based on what was previously aged in the same barrel. They recently released five new barrel-aged beauts like the Redhook with Rittenhouse rye whiskey, Punt e Mes, and Luxardo Maraschino. Cocktail Director Parker Girard says the Luxardo and Punt e Mes are polar opposites, causing a cool fight on your tongue.